Recently I have eluded to this being a "very stressful time" in our lives. I hate being vague and mysterious. Here's the deal. My father in law has cancer. Brain cancer to be specific. His is a particularly nasty, mean, aggressive, incurable (yet thankfully treatable) type. As you can imagine his diagnosis shocked and terrified our whole family. Thankfully he has a wonderful team of doctors, a loving supportive family, and we are all going to do everything we can to keep him around as long as possible. What does this have to do with cookies? My father in law adores cookies. However with his new Cancer Survivor (thanks Kris Carr for coining that term!) status he can no longer eat cookies laden with sugar and flour. You see cancer cells thrive, feed, grow and multiply on sugar and simple carbs. Want to starve cancer and slow it's growth? Get rid of the junk in your diet! Knowing my father in law will be living with cancer the rest of his life I wanted to create a few recipes for him that would satisfy his cookie craving, without feeding his cancer. 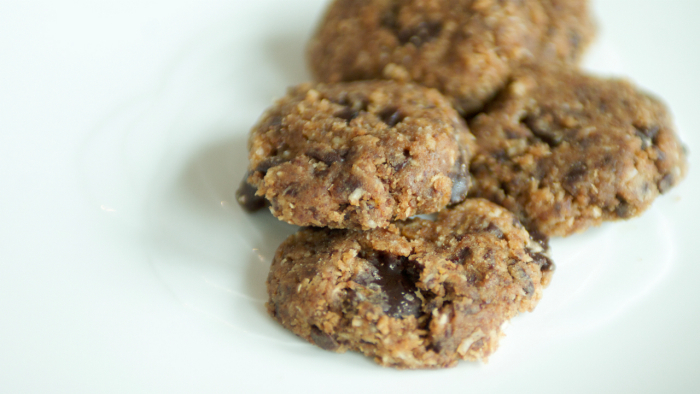 These chocolate chunk cookies were a true winner! I plan on making many, many more batches for him. I also have to note they have been a hit with his son. The Cookie Monster gene runs in the family! In a small bowl combine the ground flax and water to form a "flax egg". Place in refrigerator for about 5 minutes until a gel like texture is achieved. Allow to cool completely before handling. This step is very important! If they are not totally cool they will crumble and fall apart. These cookies do best when stored in the refrigerator.